Our generous sponsor Penny Black is offering up a $25.00 prize package! I used Petal Party to create the flowers and the creative die called "Dots" as the center frame. Wow!!! Ist das eine edle Karte!!! Ich bin begeistert. Wonderful - I love the background , the flowers and the colours are perfect ! Wida!! This is GORGEOUS!!! I love the dark pink/purple color!! Ohhhhhhhhhhhh....your card is beautiful!!!!!!!!!! Thank you. Oh my gosh...this is simply gorgeous. You nailed the challenge. Wida this is just so cool and fantastic--LOVE! Oh I really love this! Love that panel with all the circles, great blend of traditional and modern! Awwwww! This is so perfect for the inspiration especially with the added flowers!! Love that the dots are not consecutive (using the Dot die) and the color is lovely! Simple, beautiful, elegant! and I LOVE the color of your card base!! WOW, this is a beauty in these jewel colors, Wida!! Love your take on the challenge! Love your take on the challenge. Absolutely beautiful! 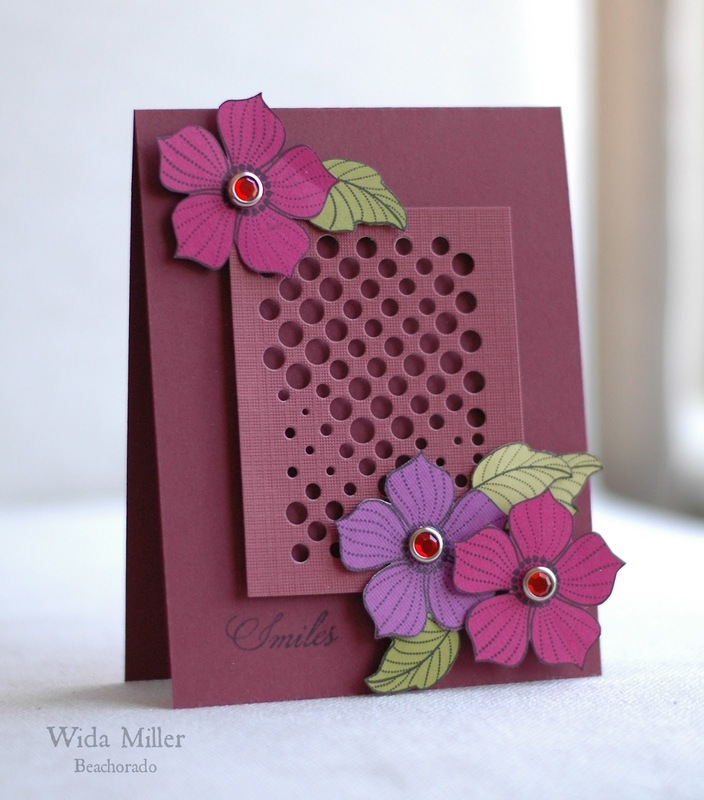 What a thoughtful design in those incredible jewel colors, Wida! Genius take on the IP!! Pretty card, Wida! I love your take on the inspiration photo! This is so beautiful Wida! The random diecut circles are a fantastic backdrop. This is one of the most beautiful cards I've seen EVER!!! I love the rich berry color and that fabulous center panel!!!! Wida.....LOVE this! Gorgeous! I love the rich colours!